Our golden “Duchess” thought it would be ok to try to pee in the cat’s litter box. 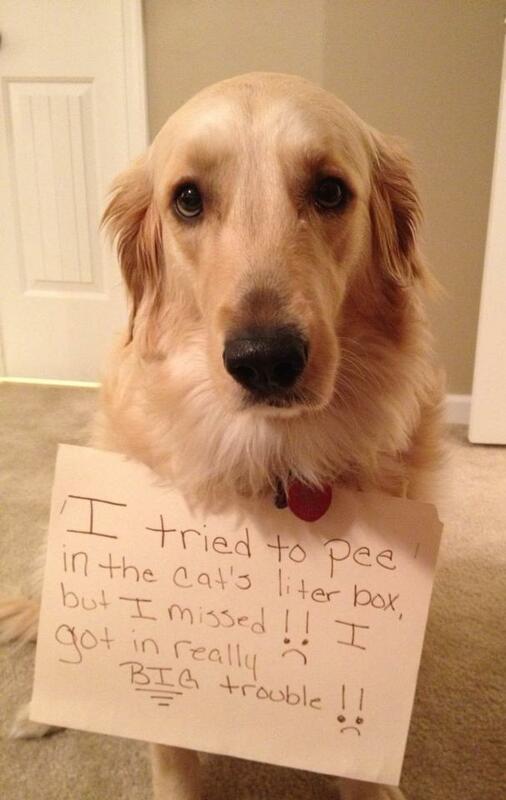 Only problem was, she missed and peed on the floor!!! I tried that once, but I hit the target. She looks very, very sorry. And she was just trying to pee where she thought she was suppose to. Can’t really get mad at her. Oh, what a sad face 🙁 Somebody needs a big hug. OMG she looks sooooooo sorry. She is a beauty. But the CAT gets to do it!!!!!! I protest this shaming! She was trying to be helpful! She’s a GOOD GIRL who was trying to not make a mess on the floor!! She gets at least an “A” for trying! I think she was trying real hard to do a good thing. She just didn’t know “how to hit the target”. I’m sure she has been forgiven b/c she looks so sweet! she says it was good enough for the cat, good enough fot her too! Poor thing! I wish I could hug her! What a face! I swear it looks like there’s a tear coming out from the right eye. Couldn’t be mad at those eye’s! We should all be so lucky to have a dig willing to use a litter box! I had a beagle that would go yse the kitchen floor when she couldn’t go outside (because she was hurt) she didn’t want to lee on the carpet. I read this a couple of days ago, and last night, for the first time, my dog of 2 weeks peed in (and missed!) the litter box! I couldn’t help but laugh about the coincidence. This is my dog and all of you are right! We could not get mad at her! Who could get mad at a face like that!!! She really is the best dog ever!!! We love her so much!!! !